A good coffee is a joy for the senses. But in order to make a good cup of coffee, several factors must be considered: the quality of the beans, the roasting process, the machine, the water and even the cup. Saeco has developed technology and innovation for espresso/coffee machines which has resulted in a full range and variety of super automatic, traditional and drip style coffee makers. One of the coffee makers that is a part of this range is the lovely and sleek Saeco Incanto SBS Fully-Automatic Espresso Machine. 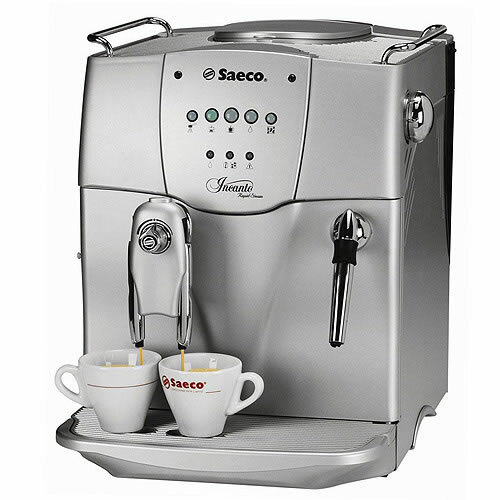 The innovative Saeco Brewing System allows you to make an infinite variety of coffees from just one automatic machine at the mere twist of a knob. Whether it is an intense Italian ristretto (turn the knob to the right) or an American-style long coffee (turn the knob to the left, the Incanto SBS AIRSSV satisfies all tastes with full flavor and a truly unique creamy finish. Key features include: unlimited toll free technical support; professional quality coffee grinder; Aqua Prima water filter; hot water dispenser; Rapid Steam technology; built-in 68 ounce water tank; stainless steel heating system; and much, much more. From a simple cup of joe to frothy lattes and mochas, The Saeco Incanto SBS Fully-Automatic Espresso Machine AIRSSV delivers with style, speed, and delicious flavor!